High quality, low poly 3D model pack, containing graves, gravestones and other objects you can find on a graveyard. 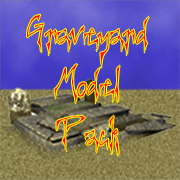 In total, there are 13 models and 2 terrain textures included in the Graveyard Model Pack. All models except one (model name: base) have 3 LOD stages (all in seperate files). The Graveyard Model Pack is ideal for, but not limited to, horror and zombie games. The models in this pack are used in Richards Game Studio's game “The Master's Eye”, which you can find here. Click on an image to enlarge or shrink. Model units are meters, except for AutoDesk .FBX, which units are in centimetres for convenient import in the Unreal and Unity game-engines. If you are a Unity user you can also obtain this pack ready to use here at the Unity Asset Store. And Unreal users can obtain this pack from the Unreal Marketplace. After your payment is completed, the Graveyard Model Pack is added to your product list and can be downloaded from the My Products section of your MyRGS account. Buyers of this product receive life-long updates of this 3D model, as long as their e-mail address is known to R.G.S. If you need another format, please contact R.G.S. here and we will see what we can do. Images may vary from original product, due to used renderer. How do I get the model? Just click on the Buy Now button below and you will be transfered to the shop.